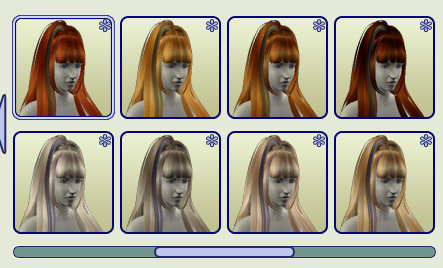 Thank you again Julie for having fixed this beautiful hair mesh. I put back a small silk strip as on the originals. However I didn't re-use the original textures. I extracted them in SimPE if you want them for your amusement. Please use Julie J's fixed mesh only, which is included in the folder. The original Bfly textures won't work on Julie's fixed mesh. Beautiful work! Thank you, lolosims. Although this is indeed a wonderful hair style. say shoulder length? Otherwise it's lovely. 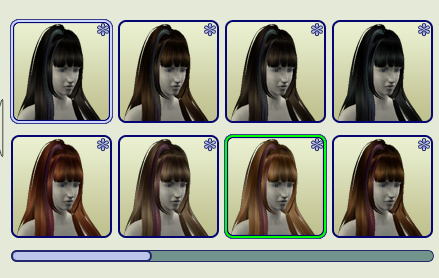 I fear that basically, making the hair alpha shorter would mess up the whole hair style itself. I tried it once but the result was really very bad and weird on one alpha bmp of the mesh as a project.